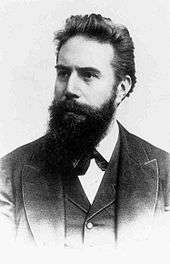 The first Nobel Prize in Physics was awarded to a German physicist Wilhelm Röntgen in recognition of the extraordinary services he has rendered by the discovery of the remarkable rays (or x-rays). This award is administered by the Nobel Foundation and widely regarded as the most prestigious award that a scientist can receive in physics. It is presented in Stockholm at an annual ceremony on December 10, the anniversary of Nobel's death. Through 2016, a total of 203 individuals have been awarded the prize. Only two women have won the Nobel prize in physics, Maria Goeppert Mayer in 1963 and Marie Curie in 1903. 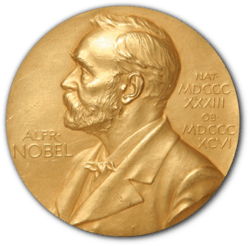 The Nobel laureates are selected by the Nobel Committee for Physics, a Nobel Committee that consists of five members elected by The Royal Swedish Academy of Sciences. In the first stage that begins in September, around 3,000 people – selected university professors, Nobel Laureates in Physics and Chemistry, etc – are sent confidential forms to nominate candidates. The completed nomination forms arrive at the Nobel Committee no later than 31 January of the following year. These nominees are scrutinized and discussed by experts who narrow it to approximately fifteen names. The committee submits a report with recommendations on the final candidates into the Academy, where, in the Physics Class, it is further discussed. The Academy then makes the final selection of the Laureates in Physics through a majority vote. ↑ "The Nobel Prize in Physics 2016". Nobel Foundation. Retrieved 2016-10-04. ↑ "History – Historic Figures: Alfred Nobel (1833–1896)". BBC. Retrieved 2015-05-03. ↑ von Euler, U.S. (6 June 1981). "The Nobel Foundation and its Role for Modern Day Science" (PDF). Die Naturwissenschaften. Springer-Verlag. Retrieved 4 May 2015. ↑ "Nobel's will". Nobel.org. Retrieved May 4, 2015. ↑ "The Nobel Foundation – History". Nobelprize.org. Archived from the original on January 9, 2010. Retrieved 2015-05-03. ↑ "Nobel Prize History –". Infoplease.com. 1999-10-13. Retrieved 2015-05-03. ↑ Encyclopædia Britannica. "Nobel Foundation (Scandinavian organisation) – Britannica Online Encyclopedia". Britannica.com. Retrieved 2015-05-03. ↑ Nobelprize.org. "Facts and figures". Retrieved May 4, 2015. ↑ "GJSFR" (PDF). Retrieved May 4, 2015. ↑ "The Nobel Prize Selection Process". Brittanica Encyclopaedia. Retrieved May 4, 2015. ↑ "Nomination and Selection of Physics Laureates". nobelprize.org. Nobel Media AB 2016. Retrieved 6 October 2016. ↑ "50 year secrecy rule". Retrieved May 6, 2015. ↑ "About posthumous awards". Retrieved May 4, 2015. ↑ Gingras, Yves; Wallace, Matthew L. (2009). "Why it has become more difficult to predict Nobel Prize winners: A bibliometric analysis of nominees and winners of the chemistry and physics prizes (1901–2007)". Scientometrics. 82 (2): 401. doi:10.1007/s11192-009-0035-9. ↑ "A noble prize". Nature Chemistry. 1 (7): 509. 2009. Bibcode:2009NatCh...1..509.. doi:10.1038/nchem.372. PMID 21378920. ↑ Tom Rivers (2009-12-10). "2009 Nobel Laureates Receive Their Honors | Europe| English". .voanews.com. Retrieved 2015-05-03. 1 2 "The Nobel Prize Amounts". Nobelprize.org. Retrieved 2015-05-03. ↑ "Medalj – ett traditionellt hantverk" (in Swedish). Myntverket. Archived from the original on 2007-12-18. Retrieved 2007-12-15. ↑ "The Nobel Prize for Peace", "Linus Pauling: Awards, Honors, and Medals", Linus Pauling and The Nature of the Chemical Bond: A Documentary History, the Valley Library, Oregon State University. Retrieved 7 December 2007. ↑ "The Medals". Retrieved May 4, 2015. ↑ The Nobel Prize for Physics and Chemistry. 1 2 "The Nobel Prize Diplomas". Nobelprize.org. Retrieved 2015-05-03. ↑ "Nobel prize amounts to be cut 20% in 2012". CNN. 2012-06-11. Retrieved 2015-05-03. ↑ Sample, Ian (2009-10-05). "Nobel prize for medicine shared by scientists for work on ageing and cancer | Science | guardian.co.uk". London: Guardian. Retrieved 2015-05-03. ↑ Ian Sample, Science correspondent (2008-10-07). "Three share Nobel prize for physics | Science | guardian.co.uk". London: Guardian. Retrieved 2010-02-10. 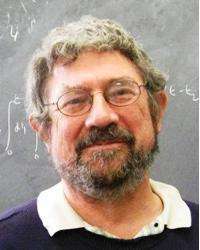 ↑ "The 2009 Nobel Prize in Physics – Press Release". Nobelprize.org. 2009-10-06. Retrieved 2015-05-03. ↑ "Nobel prize award ceremony". Retrieved May 4, 2015.